PAT testing or “portable appliance testing” is a vital part of any health & safety policy for small businesses in Coventry & the Midlands. It can be used by schools, theatres, landlords & other organisations to ensure the electrical safety of equipment. It’s also more common for residential care homes to require equipment taken in for residents is PAT tested as well. Are you a charity that takes electrical appliances as donations? More students are donating items like kettles, toasters and microwaves as they finish their courses. How can you be sure it’s electrically safe? A simple PAT test will help you know for sure. I’m happy to quote you a special rate & you’ll still get the same quality test and paperwork. Some church organisations are organising PAT testing too, having recognised how many things with plugs they have. It covers office equipment such as photocopiers, laminating machines and even the kettle in the kitchen! Have a read of this article from Coventry Catholic Deanery – here. Statistics from the Health & Safety Executive show that 25% of all reportable electrical accidents involve portable appliances or office equipment. The Electricity at Work Regulations place a legal responsibility on employers, employees and self-employed persons to comply with the regulations. This means taking reasonably practicable steps to ensure that no danger results from using such equipment. You’re required to have a systematic and regular program of maintenance, inspection and testing for electrical appliances under your control. Electrical appliances used by employees. Where the public may use appliances in establishments such as a doctors surgery, schools, hotels, shops etc. Appliances are supplied or hired. The level of inspection and testing required is dependant upon the risk of the appliance becoming faulty. This in turn depends upon the type of appliance, the nature of its use and the environment in which it is used. Do we need our equipment PAT tested? 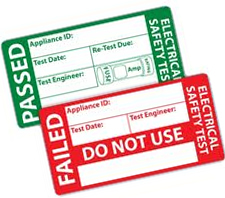 It’s always difficult to decide which appliance needs PAT testing, which is why I offer a free site visit to look over your premises to help you decide. If you’re a Coventry business owner then equipment over 12 months old should be tested to establish its condition. Do you own a hairdressers and rent out chairs? Are you really sure that the equipment being bought on to the premises is safe? Appliances should then be re-tested at regular intervals, in some situations such as a doctors surgery PC’s, printers, desk lamps and so on could be tested every two years. Did you know that if you supply your workforce with equipment to use away from the office such as laptops, power tools with chargers or mobile phones with chargers – you’re responsible for those too? Are you actually in Coventry? Unlike PAT testers that just have a Coventry phone number, I am based in Coventry so you don’t have to cover my travel expenses. I’m more than happy to travel the West Midlands if need be but I’m sensible with travel costs. Use the contact form below to send me a message and we’ll see what we can arrange. Can you PAT Test our stage lighting – we’re not in Coventry? The answer is “Yes! I can indeed…”. A lot of PAT testers are used to situations where the equipment has 13a square pin plugs or IEC connectors. Many testers encounter round pin plugs on stage lighting & refuse to test on the grounds that the connector is obsolete. Some testers will fail stage lighting because there are no sleeves on the pins, some even test the cable patch! I’ve worked in theatre for over 40 years so I’m used to the issues around stage lighting especially ex-hire equipment or items ‘discovered’ languishing in store rooms. As you can see in this article here – as long as the connector conforms to BS546 then it’s good to go – the same goes for CEEFORM connectors – more venues use them and many PAT testers simply don’t have the requisite test cable. I’ve been a theatre electrician around Coventry & the West Midlands for over 40 years so I’m used to seeing 5a & 15a round connectors in use as well as odd lengths of extension cable (some PAT test equipment will only test up to 10m long cables). I also have adaptors to test 16a & 32a CEEFORM connectors alongside 110v equipment too. I can also advise which stage lighting equipment needs to be tested regularly and which doesn’t rather than blithely put a sticker on everything I see. What makes me so special for PAT testing Stage Lighting? Don’t think just because your lanterns are old that they’ll fail a pat test, many actually pass with flying colours. Even if some items do fail, I’m experienced in either repairing them or advising how to repair them – Ledbury Amateur Dramatics even repaired some themselves – have a look here. 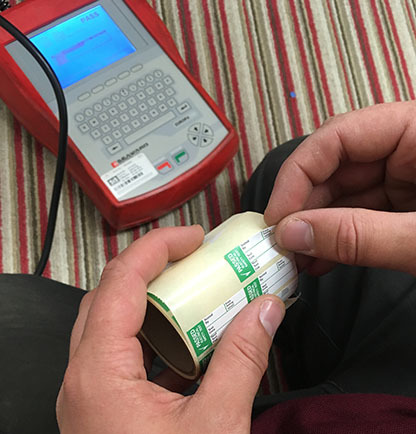 All testing is carried out using ‘industry standard’ and calibrated equipment (you can see my calibration certificate on this page) and each item will get its own unique ID and label for easy identification. Once testing is complete you will receive a copy of your certification paperwork for your records. Don’t be fooled by the web adverts you see promising 75p or less per test. Each appliance is subjected to 4 tests before it passes or fails – 4 x 75p = £3, suddenly those 10 items cost you £30 to test. 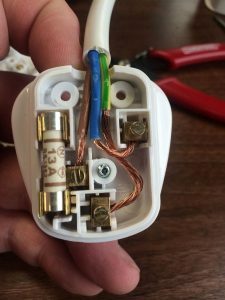 You’re often not told that it doesn’t include the fuse they often swap “Because the wrong one is fitted” or the plug that is illegal. Suddenly the £7.50 you expected has become £50! On the basis that you’ll have at least 12 items of equipment to test, I charge £3.50 per item. Typically it will take approximately 90 minutes to test and I will need to power down your equipment to test it. But I’ve only got a few items to test? If you need a TV or portable music player tested before you take it in to a care home, then I charge £7.95 per item which includes a printed PAT test certificate & test results, new plugs or fuses are included in the price (if needed). If you’re a charity shop that needs just a few items testing, I’m happy to quote a separate price. These prices are dependent on free and easy access to the equipment. I’m not VAT Registered – so you don’t pay VAT extra. I reserve the right to charge for my time if I have to wait unduly to test appliances. I’m based in Coventry, so travel to postcodes CV1 to CV7 is free. I will work outside this area but will quote separately for travel expenses. I don’t have access equipment so you’ll need to ensure the kit is accessible or “on the deck” if you want me to test stage lighting.